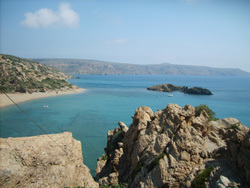 Vai is located in the far North East corner of Crete, some 30km east of Sitia. 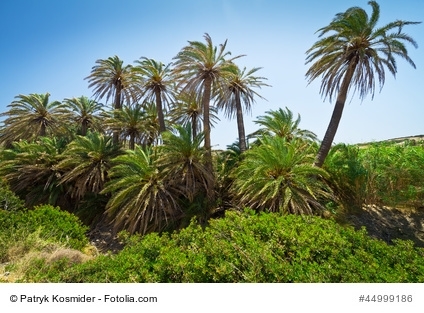 It’s the most famous beach on Crete and one of Europe’s very few palm beaches. Going there transports you almost to the Caribbean or even Thailand. 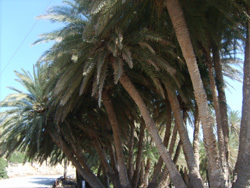 This particular species of palm is a rare one, indigenous to Crete, and can also be found at Preveli. Vai has approximately half of the world’s population of this species, known as Phoenix Theophrastii. Hippies discovered Vai in the 60s, and it wasn’t long before Vai had its own hippy population. Sadly, the hippies didn’t clean up their mess and scratched messages into the bark of the palm trees, endangering this rare species. Thankfully, local and international pressure encouraged local authorities to act; the hippies were expelled from the beach, the palm trees were fenced off and camping was forbidden. These days, there are busloads of daytrippers and hundreds of cars coming to Vai. The carpark (you’ll have to pay) is just behind the beach. Six tavernas and fast food restaurants are in competition to feed the hungry hords – prices are high and quality is mediocre. Nevertheless, it’s a great feeling to eat under the palm trees around the restaurants and imagine you’re in the tropics (some palm trees are not fenced off). You can look at them, touch them, take photos and so on. About 50m offshore from Vai, there’s a small island you can swim to. On the right-hand side behind the restaurants is a small path to a viewpoint (50m above sea level, 5 minutes walk) from which you have one of the best views on all of Crete, looking over the beach, its palm trees and the surrounding landscape. Depending on the season there are 0-4 daily buses from Sitia via Paleokastro to Vai. The bus stop is some metres behind the car park on the road to Sitia. There are some information boards, free toilets and showers here too. 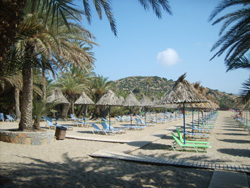 There are no hotels or rooms in Vai, but there are a few pensions a short distance away on the Sitia road. 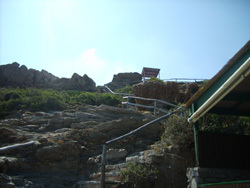 Paleokastro is the centre of the far east of Crete (pop. 1000). A quiet village with friendly people, it has good, cheap accommodations and a nice selection of tavernas. 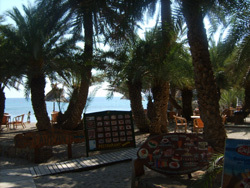 It’s pretty popular with the alternative crowd, and many Vai fans stay here and cycle, walk or drive to Vai daily. The Dionsades are a group of islands not far from Vai, and is home to 15% of the world’s population of Eleonora’s Falcon. The area is a nature reserve which is strictly guarded. If you want to visit, you’ll need a permit which you’ll not get without a very good reason.